MegaStorm Sandy is bearing down on New Jersey right now, and like most people around here I am hunkered down for the duration, which what I hope is an ample supply of food, water, batteries, candles, etc. While I still have electricity and internet I've been taking care of things that require those. Until a few moments ago I was looking up artworks analyzed by my students for a research assignment, those I am not already completely familiar with or can find in the many textbooks on the shelves. Surfing around on Google, I couldn't help but notice that their homepage is featuring Bob Ross, on what would have been his 70th birthday. So if the power holds out, I'll express a few words on the occasion. Back in the spring I put up a post regarding the death of Thomas Kinkade, saying some fairly uncomplimentary things. Still agree with those things. Some could also apply to Bob Ross, such as having a very low place in the history of fine art, not likely to ever be in textbooks or museums, etc. Yet, like most people who know who he is, I liked Bob Ross. You have probably seen his tv show, the Joy of Painting, at some point, even though he's been dead for almost two decades. Ross was known for his extremely mellow nature. A soft voice, describing the happy little clouds and trees he was placing in each painting. I have read that his shows are sometimes broadcast in other counties without being dubbed into local languages, so that those audiences can enjoy his soothing tone. 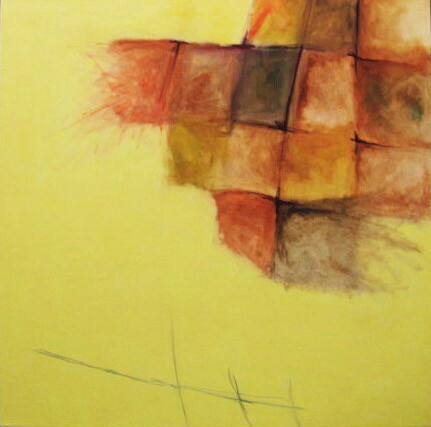 The paintings are largely forgettable, simple landscapes, usually with mountains/hills, trees, maybe fields of grass or flowers, sometimes a lake or river, but over the course of a half hour program, he always completed a new one, never seeming rushed by the format. The difference I see is that Bob Ross's art empire was built on his broadcasts, and a line of art supplies (I think I have one of his paint knives somewhere), how-to books, etc. I'm sure he made plenty of money off these. I don't know if there was ever a major market for the paintings themselves. He strikes me as someone who realized that while not everyone out there is an artist or would ever seriously study it, quite a lot of people do like creative activities. Anyone with a minimum of ambition can put together a basic palette, and using a few brushes and a palette knife, follow the steps to make their own landscape image. He got people involved. On the other hand, Kinkade was set up as the artistic genius, sharing his "inspired" landscapes with the world. His fans didn't have to know anything about fine art; he knew what was best, he did it, and they paid him for it. Sometimes thousands of dollars for mere reproductions. So neither made paintings of great significance to the art world. Neither is an artistic influence on my work. But one seems to have been a nice guy who enjoyed art and shared that love with the world, while one seems to be a guy who cared mostly about making a big pile of money. On that basis, both succeeded. Until I find a way to start making some big profits, it seems I have more in common with Bob Ross. I used spare time over the last week or so to do some paper sketches from some of the many digital photos I've taken up at the north end of the Asbury boardwalk. The idea is that I can take my time and get all the details and proportions right, not easy to do when you're standing and sketching on the boardwalk itself. Today I had some time to actually get up to the Studio and do some work of my own. I brought the first batch of paper sketches (above), all of parts of Convention Hall. 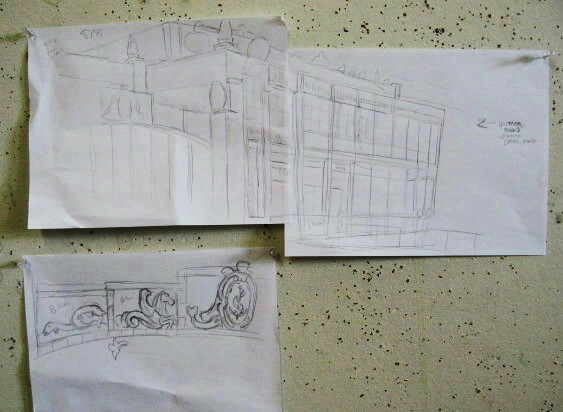 The source photos are not from the same perspective as the current block drawing, but I figured I could still use them as a source of architectural detail. Turned out to be more difficult than I expected. The block sketch that I had was done on site from direct observation of the buildings and I assumed that it was fairly accurate. 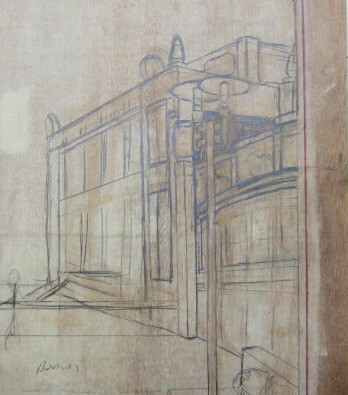 However, the proportions and relative position of various architectural elements did not match many parts of the photo based sketches. So I had to spend much of my time trying to figure out the least I could change and still reconcile my two sources. Results are below. I didn't get as far as I had hoped today, but it is an improvement. I'm going to try to get back to the Studio for a while tomorrow, because it's just easier to draw there than at home, but I'll be bringing the block home with me at the end of day. We're expecting a big storm and it could be a while before I get back there again. Thanks to the condensing of the two woodcut classes, I had all four of this season's woodcut students all in the same room this morning, and all were busy. 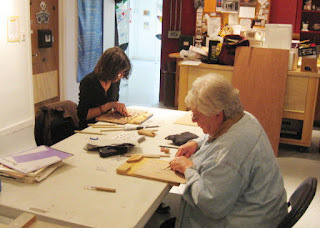 My two returning students had started new blocks last week and they continued on those today, one pulling a first state proof, and the other looking at historical relief printing in some of my reference books before taking the tools to her block. Meanwhile, my two new participants (below) officially began two blocks of their own. New tools ordered this past week had come in yesterday, so I was able to distribute those (half to new owners, half to the class supply), and demonstrate the basics. Last week my returning students had questioned the need for extending the length of class meetings, but as the time flew by today, one admitted there were advantages. And just like that, we're halfway through the four weeks of the class series. Maybe next time we'll have some work to finished work to show here. It's been almost a month since I was in the Studio to work on a new print. I've been there since for a critique, to pick up and drop off equipment and materials for various classes, and to do work for my college classes. I'm at the point with the Asbury block where I need to do the specific architectural detail. I've got all the reference photos I need, but they're on my computer. Could bring that to the Studio I suppose, but often I'm stopping there on the way from one place to another, I don't want to drag the computer around all day. No, I think that it's better to convert the photo details to paper sketches, which I can bring there to work on, handling the mirror reversal in the process. I've begun doing those sketches, and I'll post some as the block drawing goes forward. Today, though, was one of those teaching related days. 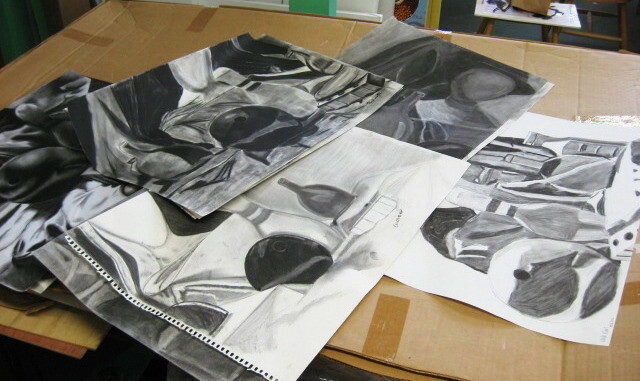 I had a small pile of charcoal value drawings from one of my 2D classes, which needed to be graded and documented. 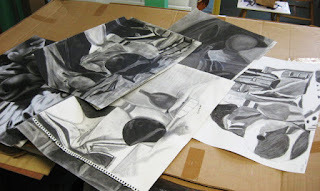 I had started the grading process while the drawings were still on the classroom desks, the still life set up, and the lights in place- those aspects related to the direct observation. Qualities of the drawings not specific to the original still life were evaluated today, and the better ones were photographed for when assignments are posted online. The students did a pretty good job with their spray fixative, but my hands were still a little dirty when the process was done, so I'm glad that I did it there and not at home. The woodcut classes that I have been teaching at the Belmar Arts Council have been relatively successful, with a few repeat customers from series to series, and some of those indicated a desire to repeat it again. And I had a few requests from potential new students, especially for a daytime class. So once my college schedule was finally set, I put both a daytime and evening class on the schedule. Every time I have run one of these BAC classes, the numbers start low, and there is usually some very last minute additions to bring the numbers to a respectable level. Well, with one day before this double set of classes, despite having several people tell me they were excited to take the class and planning to sign up, I had a total of one registered student (morning session). Not too promising. Late Monday I was contacted by a new person who told me she had signed up, but I didn't know which session. Without knowing anything else, all I could do was show up at the designated times and see who else showed up. 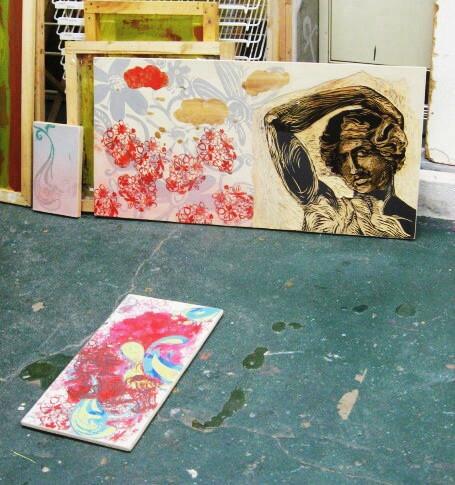 For the first day I always bring a selection of finished prints from my collection- some group folios and some examples of my own work. Between that and the class supplies, it took five trips from my apartment to my car to get all of it. 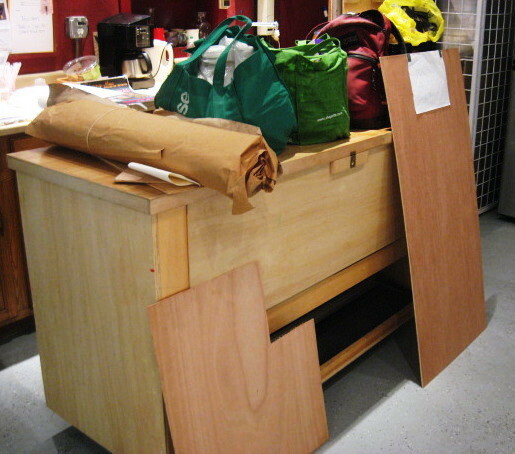 However I got to the Boatworks well before the morning class was scheduled to begin and got everything inside. My first registered student (returning from the summer) arrived a few minutes later. And then two more followed, one regular, one brand new, each paying on the spot. Three is a decent number. 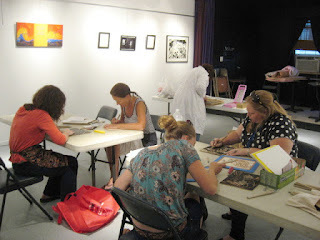 As happened with the August sessions, the returning people jumped right in to their latest projects, with me consulting as needed, and I devoted most of the time to working with the new person, showing her prints and going over some basic processes. The expanded three hour time flew by as usual. One thing that makes having two sessions the same day more practical is that I could leave those piles of supplies there in between classes. I didn't know what would be waiting for me in the evening, except that my Monday sign up wasn't there in the morning, so I figured I'd have at least one. Again I got there early to set up, and my new person showed up on time. Unfortunately, she was the only one. 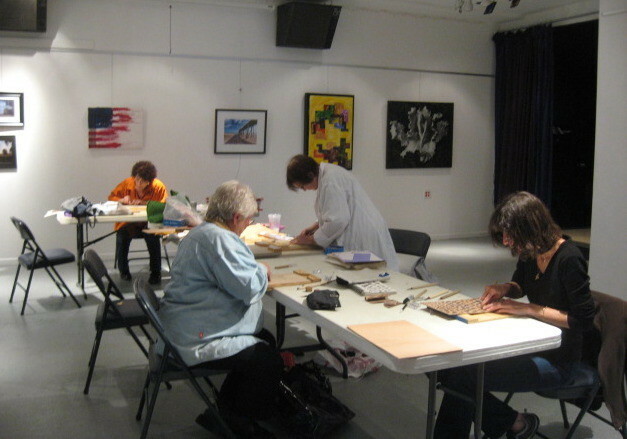 She has a bit more print experience than most who take this class, and was very interested to see the group folios, not just for the woodcuts but for all the other processes demonstrated. It turns out that daytime would work better for her, so she'll move to that one (giving me four), and unless there is some sudden demand in the next few days, the evening class will be cancelled this time around. Next week, the art stays home, and the hard work begins. I'm ready, and I think they will be, too. 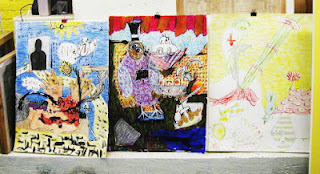 I've had a Floating World series block in progress for quite a while, my general daytime scene set in Asbury Park. It's been delayed by having to divert to other prints, and by various things going on in life, but most of it is worked out now. I have to deal with all the figures (a model would be very helpful for some of them, as well as some from a planned beach themed block) and a whole lot of architectural details, for which I have plenty of photo references. I could have advanced that today, but today was sunny and mild, and we won't have too many days like this coming the rest of the year. So rather than sit and work inside, I decided to drive down to Point Pleasant and gather material for another planned Floating World print, one devoted to rides. There were a lot of things I liked about the boardwalk when I was very young, but the rides were at the top of the list. 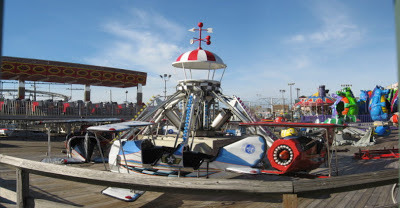 Not that the rides were very exciting by adult standards, mostly just the little kid rides where you sit in a miniature sports car, fire truck, airplane, boat, etc that goes around in a circle for a few minutes. As I got older, I had less interest in rides (though I never got tired of bumper cars), so I figure a ride themed print should focus on those kiddie rides. I have a few photos and sketches going back to when I was working on my tower print, but I will need more for this new print. The last time I went down to Point in the off season hoping to collect ride references, they were pretty much all gone for a major board replacement project. However, I was hoping to have better luck today, figuring that they were possibly still operating just a few weeks ago and maybe hadn't gotten around to putting everything away for the winter. It was pretty much what I expected- lots of free parking, no one on the beach but a fair number of people walking the boards, and though some of the rides were missing, there were a lot more in place than the last time I was there. The gates around the ride section were locked, but that was expected, too. Despite having to deal with obstructed views and shooting through the fence, I got some useful photos and a few sketches. Also stopped in the Tiki Bar for a minute to take a few mental notes, but that print is still a ways off in the future. Late in the afternoon yesterday I took a ride up to Home Depot to pick up a few needed items: a new piece of wood to replace the one I cut up for students the other day, some coarse grain sandpaper, and couple of wooden drawer pulls. The last items are for use in printing. Many years ago I was teaching a workshop at PCNJ and one of my students brought one with them, having used one in college as a printing tool. I bought a couple of small ones shortly after and found it helpful for printing small details. Definitely worth the 80 cents I paid for each. Somewhere along the way one went missing, but the one I still have has been helpful for printing hundreds of my own proofs, plus dozens of college student prints, and now it gets passed from artist to artist in my local workshops. The Belmar workshop starts up again next week, so I figured it would be good to have a few more. They didn't have the same type that I had bought years ago, so I picked up one that was a little smaller, and one a little bigger. I'll give them a try next week. Next stop was to drop by the Studio, where I added the new piece of wood to my supply pile, and used the new sandpaper to sand the edges of the 24 small blocks that I cut the other day. Those came home with me. Along the way I had gotten word from my parents that a package for me from my friend Dave had arrived at their house, so I went there next. I knew this was coming, but didn't realize it would be so soon. 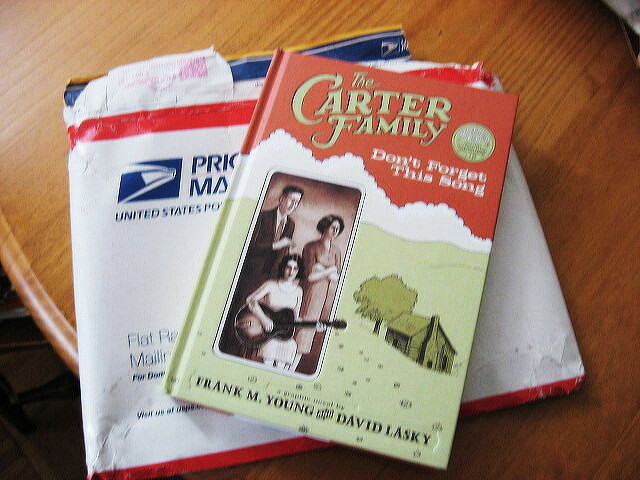 Dave has been involved in a major project for almost a decade, a graphic novel biography of the Carter Family. Dave and another Seattle based comics creator, Frank Young, got the idea early last decade, and produced and published a sample chapter. It was admired, but didn't result in anything right away. In 2007, Dave followed the example of many other comic producing friends and got an agent, put together some more samples with Frank, and this all led to a book deal with a comics division of Harry N. Abrams publishing. Work began in earnest in late 2008 (I wrote about it back then) and it's been a long slow process, with some factors beyond their control. But then this is no little comic book, but a hardcover book of almost 200 pages, called Don't Forget This Song. Mostly it was Frank doing the writing and Dave doing the art, though each helped with the other task. (for example, it seems Frank did most of the coloring, and an excellent job of it in my opinion) I'm looking forward to putting together some undistracted time so I can sit down and enjoy it, maybe while listening to the accompanying disc of rare Carter Family radio recordings to create the right atmosphere. Dave and Frank kept a blog about their creation of the graphic novel, including previews of many pages, looks at alternative artwork, stories of related interest, and now links to some of the great reviews the book is getting. So check that out, then go get yourself a copy of the book. It's a busy time of year for woodcuts. I have two sections of 2D Design this semester, one at each school, and that means two classes making woodcuts. The first of those classes will need blocks this coming week, so today I put in some Studio time cutting them up. Both classes are a little smaller than usual (most semesters I start with a full roster, or even an extra student), so one 2' x 4' sheet of wood was enough to yield enough 6" x 8" blocks for both classes. I didn't have any sandpaper with me, so I'll swing by there in a few days to take care of that. Besides the college classes, I'm gearing up for another round of woodcut classes in Belmar. This time around the classes will expand from two hours to three, at the request of the students planning to return. And in addition to the usual Tuesday evening classes, I'm also running it on Tuesday mornings, to accommodate those who can't make the evening sessions. The first meeting will be October 16th, so if you are interested, go check out the details on the BAC woodcut page and sign up for a spot in one of the classes. 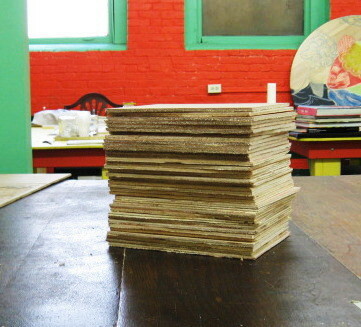 So in October it looks like a few dozen people around the state will be learning about woodcut. I'm glad to be doing my part. The first of the month, time for another critique. Didn't get a lot of confirmed plans to attend, but I did manage to get the favorite cheese, so I was ready to go. Unfortunately the parking lot up at the Studio was jammed full of dance moms, with no sign of anyone leaving any time soon, so I settled for parking a couple of blocks up the street. We ended up with a relatively small crowd, just 5 participating artists and one regular with no art but just wanted to hang out with us. It was kind of like the earlier days of the group. Perhaps a coincidence, but this meeting marked the 5 year anniversary of the first meeting of this critique group. Some of the same people involved from those early days. We got things started with Molly, who had some of her recent dragonfly pieces around the room, which are just waiting to be poured with resin and delivered to the cafe in Somerville that commissioned them. 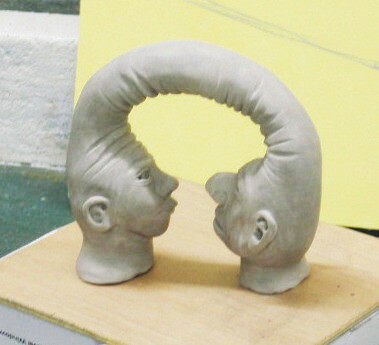 But mostly we talked about a new piece she has going, shown above. the inked carved section of the wood on the right goes back to the early days of the Studio, but the left half is new and has her excited. Next up was Tim, one of those people with long time connections to the Studio, taking classes with Molly and coming to the earliest critiques. 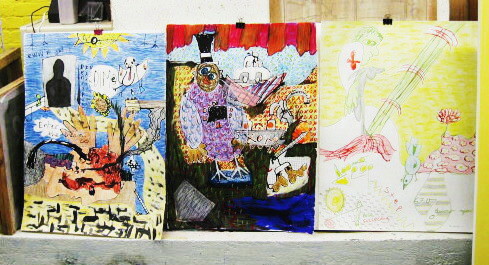 Above are three new pieces of mixed media drawings. Tim selected me to go next, and I showed the latest update to the Asbury Park boardwalk scene, from last week's drawing. That led to some discussions of the series itself, with one of our new regulars asking about the choice of the diptych format. It made her think of stereo images, the kind from long ago viewed through a stereo optical device to simulate a 3D effect. Not what I'm doing, and not something I'm looking to do, but it's an interesting association. Next up was Vince, and the large (about 4' square) painting shown above. He's worked with grid formats many times before, but the group was very excited by this new piece, where the grid is a bit looser and the composition more open. Finally, Margery showed a new, still unfired clay piece, which generated a lot of discussion about the process involved in creating it, as well as the possible meanings. As a result of our small crowd, we had time to talk about all the work, to digress into other topics as we tend to do, and still finish on time. It's been a long day, so I don't mind that. My morning class at the university included a critique of their first projects, and they found it hard to believe that I willingly put myself through a critique and find it an enjoyable experience. But if it wasn't fun, we wouldn't be still doing it five years later.